It´s well known that Germans love the beautiful Spanish island Mallorca. The island has plenty of things to offer and especially Palma is a main spot for high class food and unique hotels, such as the boutique hotel Cort, where I had the pleasure to spent 3 nights at for a press trip..
Hotel Cort is a luxurious 4-start boutique hotel which is located at the Plaça De Cort, right in front of the famous Cort olive tree, which holds already several hundreds of years in age. The boutique hotel has a unique vintage flair and shares and astonishing atmosphere with its red facade. The hotel itself has only 16 rooms, which offers its guest plenty of privacy and access to all facilities. The entire building has an old-fashioned character, which was for me absolutely fascinating, as I loved the interior and small details. The hotel is definitely not a standard hotel which one visits, this is a hotel to remember. The entrance is covered is small white and black mosaics, shaping the name Cort. While one steps into the doors of the hotel, it feels like entering a different century. When staying at a hotel, and I travel often and visited so many hotels, it´s most important for me to experience “something special”. Hotels should be more than a cozy place where one rests and stays overnights. Hotels should offer comfort, should offer a special experience, which could be in reference to food or service and a hotel must have a “soul”. At hotel Cort I could find all of those things stated above but most of it all I could feel the soul of the hotel. 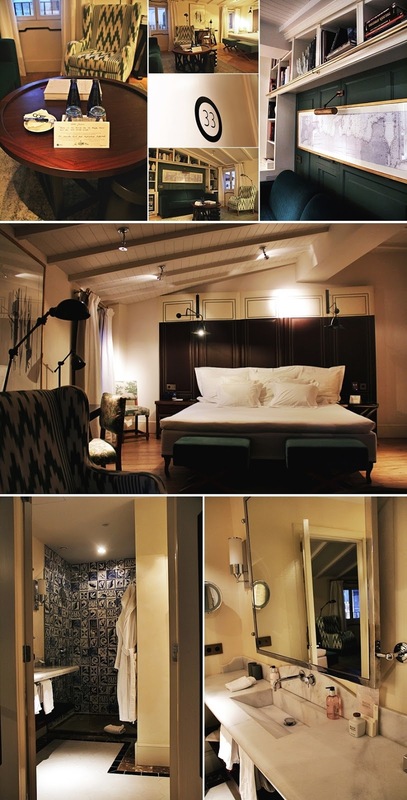 I´m sure that I will be able to remember the hotel and my stay even in a few years and will review the single details of the interior, as I was so impressed. I just felt that I have spotted the right place to be. When we checked in, we were guided to our suite in the 3rd floor which was on the same level as the pool entrance, which was only separated by a staircase to the rooftop. Our suite was devided into two rooms. One was a kind of a livingroom, with a couch area and a wide bed on the other side, the other room was the bathroom with a shower. The suite featured stylish interior, such as a green velvet couch and an armchair in colorful pattern. I could also find a lot of books inside the room and a map just located above the couch. I felt like in a picture-perfect Pinterest pin and also got inspiration for my apartment as I really liked the colors and the design. The interior also referred to what I mentioned earlier. It´s like a red thread which leads from design, to atmosphere, to service and the pre-arrival experience, where I received a lot of information within my booking confirmation. For guest who prefer more or different pillows there is even a wardrobe featuring more selection. In terms of the bathroom I must mention how much I liked the soaps. All products are delivered by Molton Brown London, which again refers to the luxurious boutique character. Colorful shower gels and soaps in purple and green colors were even enhancing the magical power of a hot shower after a long day in the city. What surprised me, to be honest, was the fact that I couldn´t hear a single noise in the night or day, even though the hotel is located in the heart of the old city of Palma. It was also lovely to overview the Plaça De Cort by day and by night. Unfortunately, our suite wasn´t featuring a balcony, however there are suits available which come with a balcony. There´s nothing better than having a good rest after a long day of travels. As we arrived pretty late at the hotel we simply fell into the pillows and slept right away. I was thrilled for the breakfast on the next day. As the Cort boutique hotel features an exclusive selection of 16 suites, there is of course no regular breakfast buffet as we might know it from regular hotels, but we all know that a “good” breakfast can make your day, that´s why my expectations haven been high after the previous impressions of the hotel. Orders can be taken by a menu which was included in our stay. 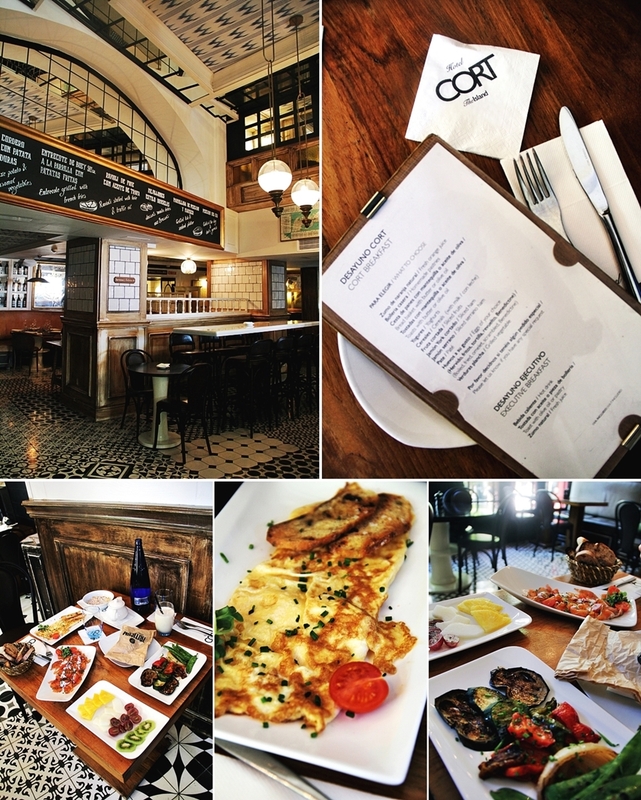 The breakfast menu features dishes like salmon, egg, gluten free bread, fresh fruits and juices, grilled vegetables and to make it short – dishes for all tastes. Even homemade fresh pastry is served along to coffee, which I heart of, from other guests, should be really good. The restaurant is open for breakfast, lunch and dinner and the food can be enjoyed indoors and outdoors in a separate area where guests can enjoy the sun and snap a view on the famous olive tree. 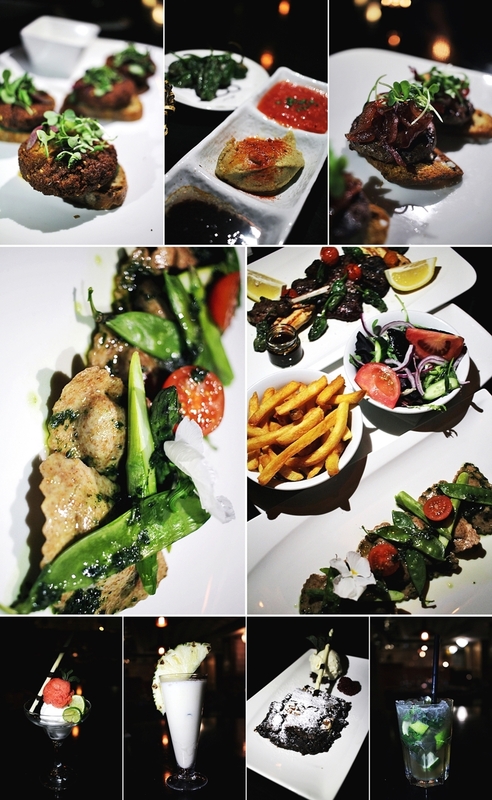 The lunch menu varies every day and comes with a special offer which has a decent pricing. However, guests can also order a la carte. An exclusive feature and great selling point should be the rooftop pool. My opinion might be influenced by the fact that blue is my favorite color but I fell for the clean design and rich contrast of blue and yellow, which were the main colors at the rooftop. 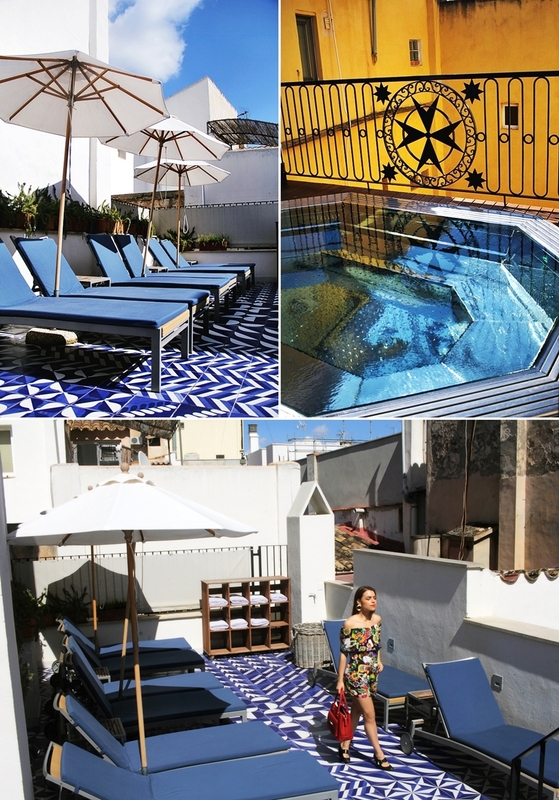 As we were spoiled with perfect weather during our stay, I could “test” the rooftop and pool and had a wonderful wellness experience, while tanning in the sun, only being distanced by a few steps to my suite. Coming from the fact that there are only 16 suites in total, I could also enjoy a lot of privacy during the entire stay, which is pretty surprising by including the fact that the hotel was fully booked during my stay. For our farewell we decided to spoil ourselves with a dinner experience at the Cort hotel, where we were able to try an exclusive selection of the menu. As I traveled with a partner, we enjoyed best of both worlds, the meat option and the vegan options as well. As the Spanish culture is not focused on “vegano” food, I was even more happy that there were several vegan options on the menu, such as falafel and even fresh noodle dishes. I can also recommend sorbet and an alcohol-free version of the popular pina colada, which comes with coconut milk. 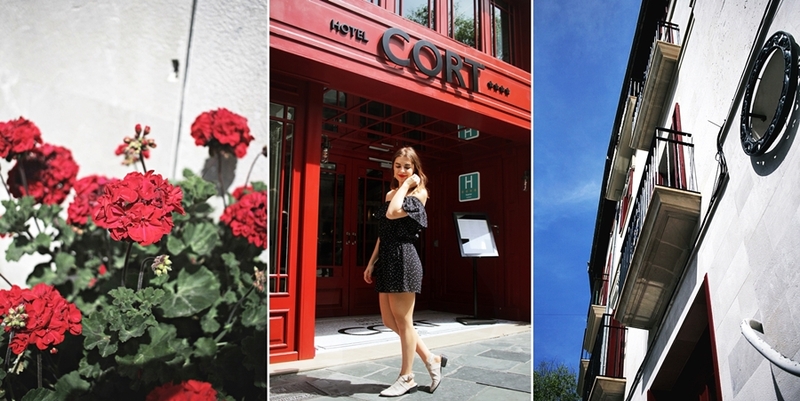 I truly can´t hide the fact how much I enjoyed my stay at the Cort hotel. From arrival to departure – everything went smooth, there were vegan options on the menu, the staff couldn’t have acted more professional and assisted me so well when I asked questions regarding ingredients. The location was just phenomenal and a gym was less than 1km in distance by walk. The hotel area offers a lot to discover, there is public transport and the Palma Cathedral is a direct neighbor. Besides the fact that this was a media trip I would always return with my family and stay at the hotel for a private purpose.